Many of our Littleton, Colorado area patients practice good hygiene, and have taken care of their teeth, but are still unhappy with the look of their smile. In some situations, when orthodontic treatment isn’t the best solution, Dr. Belongea may suggest veneers as an option to improve the look of your teeth. If you think veneers may help you with your smile, schedule an appointment with Dr. Belongea today to learn more! A veneer refers to any thin covering that is placed over another surface. When used in dentistry, a veneer is a very thin but strong layer of porcelain that covers the tooth, acting as the outer enamel. Dentists use porcelain because it looks like a natural tooth’s surface and acts in the same way a tooth’s enamel does by protecting it from wear and tear. The best part, however, is that unlike enamel, porcelain does not stain. Technological advances in porcelain veneers have made them thinner and more durable than ever before. 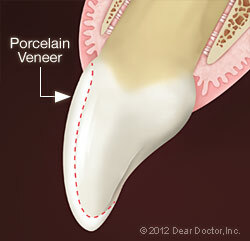 Veneers can now be placed directly on to the surface of a tooth without having to remove any existing enamel. In some cases a thin layer needs to be removed in order to make the tooth look as natural as possible once the veneer is placed. Color — When teeth are exposed to foods, drinks, and things like smoking, they can quickly become discolored or stained. Age can also play a factor, as your teeth will lose their natural shine over time. Veneers can give you an instant boost of color, returning your pearly whites to their original lustre! Size & Shape — Even normal wear and tear can cause unshapely edges on your teeth, especially if you grind your teeth. 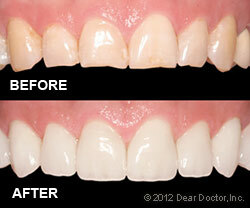 Veneers allow you to refine the look of your teeth, giving them a smooth and consistent look. Dr. Belongea can even work with you to determine which finish looks best, a more feminine round edge, or a masculine, square tooth. Find the look that flatters you the most using custom veneers. Alignment & Spacing — Orthodontic treatment is perfect for major alignment issues, but for people with small cosmetic concerns, veneers may be the ideal solution! A porcelain veneer can help hide gaps between teeth, or areas where teeth do not meet evenly, as well as giving your teeth a laser sharp bottom line. The first and most important step in getting porcelain veneers is telling Dr. Belongea and his professional team exactly what you don’t like about your smile. We suggest you bring a picture of your smile and tell the doctor what you don’t like about it. We can then go on to create a wax model of your teeth and put on “veneers” to simulate what they will look like when we are done. We may also add plastic, tooth-colored material to you teeth to give you and idea of what veneers will look like on you. After discussing your plan with Dr. Belongea we will prepare your teeth by removing a small portion of your enamel if necessary. We will then need to take molds of your teeth, which will be sent to our highly skilled dental laboratory to make your custom porcelain veneers. We will provide you with temporary veneers to wear during the few weeks it takes to for the permanent veneers to be completed. Once the laboratory has finished your veneers and we receive them, they will be cemented on to your teeth to create your perfect smile! Even with veneers it is important to maintain a consistent brushing and flossing schedule to protect the tooth below the veneer, as well as your gums. Veneers don’t give you a free pass to skip visits with us, so be sure to keep up with regular checkups as well. Porcelain is a strong and beautiful material, but it does have limits, and shouldn’t be exposed to anything that would damage your natural teeth. Using veneers to open packages, bite very hard or sticky foods, or other damaging activities should be avoided. Finally, if you grind or clench your teeth at night, we might advise you to get a custom-made night-guard to protect your veneers. If you have questions about the benefits of veneers, or if you are a candidate, simply schedule an appointment with Southwest Adult Dentistry to learn more. Our dynamic team is committed to creating a warm and professional environment, and will work hard to help you maintain a beautiful and healthy smile!